Have you ever come across a fake Facebook profile that pretend to be you or someone else or someone using your photos or representing a celebrity ,an organization. If that is the case then you have the full right to report the problem to Facebook as FB gives you the right to report any profile that violates the statement of rights and responsibilities. The Facebook team really is concerned about your privacy and takes quick action if they find that the profile is really fake and violating the rules. Recently I came across a profile which claims to be my high school’s Principal. I used to the report function and bingo the profile was blocked by Facebook.That’s when i decided to write a post so that it could help people who are not aware of this function. The “Report/Block this Person” link is in the bottom left column of the profile.Select ‘Fake profile’ as the reason and adding the appropriate information. Make sure you choose the correct option so that it will help the Facebook team to take the appropriate action as fast as possible.You don’t need to worry as your report will be kept confidential. 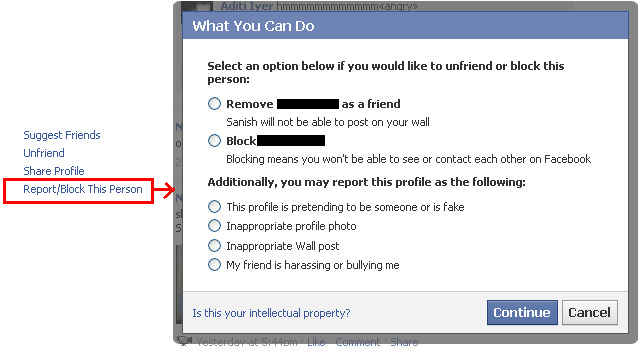 What are your views on Facebook report function and have you ever come across a fake profile?